Huawei is planning to launch a new device in the market by the name ‘Mate 9’. Over the specifications, the device includes a Dual SIM (Micro-SIM/ Nano-SIM, dual standby) slots. The smartphone comes with a 5.9 inches screen with a resolution of 1080 x 1920 pixels (373 PPI pixel density) IPS-NEO LCD capacitive touchscreen. The device is powered by an Octa-core 2.6 GHz Cortex-A53. This phone is protected by a Corning Gorilla Glass 4. The smartphone supports Multi-touch facility also. The smartphone comes in two variants regarding RAM and internal memory. The device comes in 64 GB internal and 4 GB RAM. And the Other option comes with 128 GB internal memory and 6 GB RAM. The internal memory can be expandable up to 256 GB using a microSD card. The device is enriched with a 12 megapixels primary camera with face detection, auto-focus and LED flashlight. The primary camera records a video of 2160p at 30fps. The secondary camera has a lens of 8 megapixels for selfies and video calling and provides the option of video recording at 1080p. The camera features Geo-tagging, touch focus, face/smile detection, HDR, and panorama. The device holds a 3.5 mm jack in it. The device also supports fast battery charging technology. 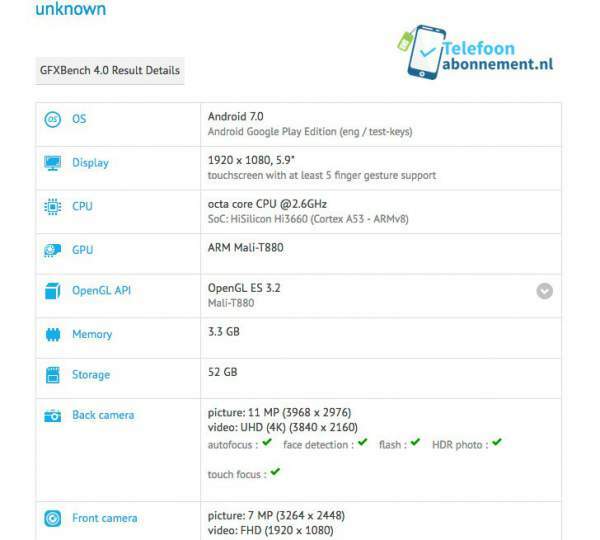 It is expected that this smartphone runs on Android OS Marshmallow v6.0 initially and later upgraded to Android Nougat v7.0 after the launch of Android N.
The dimensions and weight of the device are still unknown to us. But it is estimated that the dimensions will be 157.1 mm x 80.6 mm x 7.9 mm and weighs about 185 grams. Other common facilities like Wi-Fi, Bluetooth v4.2, GPS, NFC, FM Radio and Type-C 1.0 reversible connector are present in the device. The phone is rich with the sensor. The smartphone holds fingerprint sensor, accelerometer, gyroscope, proximity sensor, barometer, and e-compass. It is also leaked that the device will be powered by a non-removable Li-Po battery. But the exact capacity of the battery is not leaked till now. But it is assumed that the device will hold a battery of 5,000 mAh. The box of the smartphone contains a handset, a USB data cable, an adapter, user manual and earphones. Regarding the launch, let me tell you that the company is organizing an event in Berlin on 1 September. I am sure that it will be the perfect place to unveil this upcoming smart product. Let’s wait for this device and hope that all your expectations are fulfilled by the company. For more updates, Stay tuned and do subscribe to the website.